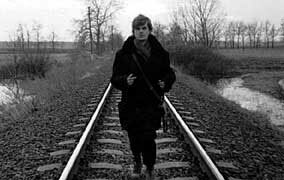 If you’ve come this far – that is, deep within the information portals of cinema – there’s still a good chance you’ve never seen a Béla Tarr film. Take, for instance, the tardy praise for his latest film, Werckmeister Harmonies (2000), at this year’s Director’s Fortnight in Cannes. If you heard more than whispers of its standing ovations from the mainstream press, that was already exceedingly generous. Only now, in the resting days of the year 2000, has the film started to generate the kind of acclaim worthy of a worldwide distribution deal. If it’s an apology for the kind of uninspired notices the director’s previous 7 and a half hour Sátántangó (1994) received, many of which made it seem worth venturing into, if only as war story or Andy Warhol-style endurance test, then that’s a start. The run-time is actually pretty light. There are only 39 shots. But then if you’ve actually seen a Béla Tarr film, you know that’s all very relative. Tarr, who has joked that Kodak’s constricting 11 minute 35mm film can is a form of censorship, has just toured his most accessible project, after more than a couple of harsh winters shooting and a search for some desperately needed funding after two budget breakdowns, a search that led him into the offices of every important financier in Western Europe. When I met him earlier this year at the Chicago International Film Festival, he commented on how he arrived in Cannes this year (for the first time), “Straight from the lab – exhausted and without a clue of what would happen,” though he seemed no less preoccupied and desperate with his own intricate thoughts as we sat to talk. Trying to learn how to speak to him was about as difficult as getting to him personally. “He doesn’t like to talk about his work,” the festival publicist told me, which made me quip about Tarr’s unique audience Q&A responses. “No silly questions,” Tarr would later tell me, and I knew he meant business. If anybody has ever bragged to you about his larger than life persona, hopefully they didn’t leave you with the impression that Tarr was any less eloquent and quick-witted as Orson Welles. But I’ll get to that later. There’s still an immensely fascinating film dream dry in the center of parted seas, with distributed works on one side and the forgotten films of universal ash on the other. When the waves crash down, where will Werckmeister belong? Its importance begins with its two companion pieces: Damnation (1988) and Sátántangó, part of an already legendary “late period” in Tarr’s (so far) short career, with the dominating DNA make-up of high contrast black-and-white, very, very long takes, and, as a friend of mine has noted, “Amazing opening sequences which really grab one’s attention.” In Werckmeister Harmonies, this starts as Janos (Lars Rudolph), a wide-eyed eccentric in small town Hungary, demonstrates how our solar system works, late one night at a bar, using a few drunks as models (this is the film’s longest take, at 11 minutes). There is warmth in this scene, which curiously starts as a close-up of a wood stove. The image of the stove is even repeated 30 minutes later, as Janos heats a canned meal but at this point, the symbolism has dwindled down into nothing. The image can no longer be associated with warmth, and so begins an ever-embittering pattern; with the assistance of Tarr’s steady-cam operator, we waltz patiently through the depressing town streets, slowly feeling this cancer that is loneliness. What survives from this lifeless front, in the midst of all the inexplicable complications that will eventually ensue, is a wonderful soundtrack, which binds its characters and leaves the perfect emotional resonance. Each scene is like waking up from a dream, and then, like a splash of cold water, an incredibly bleak view of Eastern European thinking, a visual translation even. The importance of Werckmeister Harmonies depends largely on this, as a film which omits the sarcasm and cynicism of his previous Sátántangó (with the exception of one scene involving two small kids gone nuts) and labors greatly at keeping the same intensity and sadness. This is mostly achieved through its main protagonist, played by German actor Lars Rudolph (also seen this year in Tom Tykver’s The Princess and the Warrior ), who became Tarr’s inspiration for the project when they met by chance in Berlin six years ago. “It’s very funny,” Tarr says, “I didn’t even want to shoot this story.” (The film’s original source material – the novel “The Melancholy of Resistance” – is by László Krasznahorkai, a long-time Tarr collaborator on his most important films.) As Janos, Rudolph is physically apt as the quintessential outsider, the only citizen so estranged from the rest of the population that, God watching, he has unconsciously taken unto his shoulders a strong sense of community, so as not to be totally left aside by his quietly detached and tremendously insecure townspeople (and as fate would have it, he’s the only one that ends up going mad). You know, I never really did learn precisely how to talk to Tarr, how to get real answers out of him. It was important to witness his presence though, to try to guess what he was thinking. Aside from being the most talented filmmaker to emerge from the dismal plains of Hungary in the last 20 years, Béla Tarr has the spirit of an old Hollywood director, somebody like Fritz Lang, Douglas Sirk, or Nicholas Ray (the eye-patch club). His physical presence is a monument to cinema, and that’s all too rare nowadays. As a society, we have always based our world on both fake and real images. This cannot vanish in the world of cinema, especially with such lovely films as this one. With assistance from Eric C. Johnson.